WWE’s All-Women Event: Let’s Book the Show! Rumor has it WWE is planning an event this fall that will be strictly for female talent. A sort of make-good for the ladies being left off the Greatest Royal Rumble show in Saudi Arabia. I’m inclined to believe it will happen, and that they’ll make a pay per view out of it. Why not? WWE wants to be seen as progressive. We’ve had the women main event TV shows and pay per views. They’ve had a Royal Rumble Match, an Elimination Chamber Match, Money in the Bank Ladder Matches, etc. This seems to be the next logical step. But who or what do you put on an all-female pay per view? Supposedly, this would be like the Women’s Royal Rumble Match in that it would include names from the past. Though in truth, I’m not sure they need to do that too extensively. If they focus on telling good stories, they’ve got more than enough ladies to put on a good show. Maybe even a great one. My usual speculation is going to look a little bit different this time. Whereas with predictions I start from the bottom of the card and work up, with this one I’ll be starting with the main event and working down. I’m also jumping to conclusions about who the champions will be once we get to this show. But with or without championships, the matches should work just fine. The seeds for this one have obviously been planted for awhile now. It’s just a question of how long they want to wait. 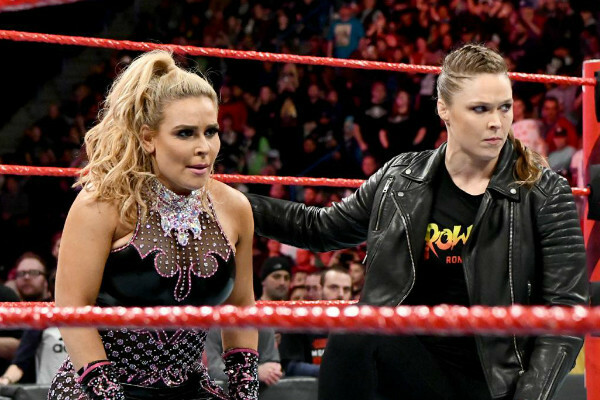 I wouldn’t try and make a big Wrestlemania match out of Ronda and Nattie. But for something like this it would work just fine. There’s also a great story there if Ronda is the champion. Natalya comes from a wrestling family, and has seen the hardships it can wreak. Her husband suffered a career-ending injury in the ring. She herself spent years working her way to the top of WWE. And yet, here Ronda is with one of the top titles in the industry after less than a year. Here’s a sad truth: Natalie Neidhart-Wilson’s contributions to the “Women’s Evolution” are largely overlooked. But in many ways she was ahead of her time. Before we had Sasha Banks, Bayley, Becky Lynch, or even someone like Paige, we had Natalya working a more sophisticated, technically sound style. The first Charlotte Flair match that really got people buzzing was with Nattie at the inaugural NXT Takeover show. Here’s where I’m going with this: Nattie deserves to main event a show like this. Future generations will look back on her the way we now look back at names like Molly Holly. If the die-hards aren’t hooked by Ronda vs. Nattie, this should do the trick. I’ve touched on this a little bit already, but WWE needs to work on rebuilding Asuka a bit. She lost her undefeated streak at Wrestlemania, then she lost to Carmella at Money in the Bank, failing to win the Smackdown Women’s Championship on both occasions. 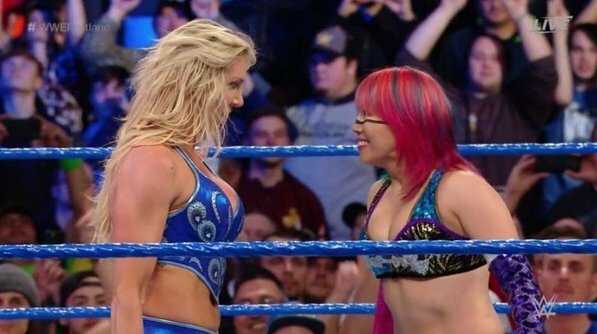 It was once unthinkable that someone could beat Asuka. Now she’s dangerously close to becoming just another woman on the roster. As such, Asuka needs to beat Carmella at Extreme Rules. Then she needs to retain over Charlotte Flair at Summerslam, with this being the rubber match. The ladder is some nice icing on the cake. Though I’ll admit, I’m nervous about Charlotte potentially doing one of her moonsaults off the damn thing. One of the highlights of this year’s Women’s Royal Rumble was Mickie James and Trish Stratus being in the ring together for the first time in over a decade. The fans popped big. It was the first time Mickie hast generated that kind of buzz since she’s been back. So if the people want to see it again, let’s give it to them! As you’ll see, I’m reticent about giving alumni prominent spots on this show. Because, and I’m sorry to say this, most of them weren’t that good at the Rumble. But there were exceptions. (Michelle McCool, Beth Phoenix, Molly Holly hitting the Molly-Go-Round.) Trish was one of them. I wouldn’t ask her to go 30 minutes with Charlotte or Sasha. But a veteran like Mickie can carry a match with her as a special attraction. By the time we get here, I assume Sasha and Bayley will have had a couple of pay per view matches already. So this is my attempt at letting these two blow off this program once and for all by putting on a clinic. I don’t know if can top their famous NXT Takeover: Brooklyn match. But they can certainly try. The winner of this match would theoretically be in line for a Raw Women’s Title Match. That’s a natural doorway to Ronda vs. Sasha, if you ask me. Admittedly, this is a throw-together match. I had originally put Becky with Charlotte, but figured Charlotte vs. Asuka would be the bigger match. I do think Charlotte vs. Becky would be money, though. It’s well documented that those two are good friends. On the upside, I would have Becky win this one. While WWE loves their multi-person matches, I’d keep it at three here. No need to muddy the waters. If they want to put more Smackdown ladies out there for this one, they can put somebody on commentary. Peyton Royce and Billie Kay come to mind. But they could have Lana do it as well. A little more nostalgia in this one. I like Lita being with a spiritual successor in Ember Moon. As for Victoria, she was conspicuous by her absence at the Royal Rumble, and deserves a spotlight like this. She’s also a great heel. So she makes sense for this spot. If Nia loses, her head is shaved. If the Riott Squad loses, Ruby’s head is shaved. We see Handicap Matches on Raw all the time. But I like the idea of the larger Nia Jax against the three Riott Squad members. The hair stipulation makes for some nice garnish. Plus, I bet Ruby looks good bald! The caveat here is that Ruby might be injured and unable to wrestle. If that’s the case, depending on how much she’s healed at this point, I say you keep her on TV as much as possible. Have her mentor Liv Morgan and Sarah Logan in backstage segments. Without spoiling anything, unless something unexpected happens, this match will very happen again in the very near future. I see Kairi Sane winning her first NXT Women’s Championship in that encounter. This would be Baszler’s rematch for the belt. Normally I’d be reticent to put NXT matches on a main roster card. But given what NXT has done for women’s wrestling in the last few years, to not include this championship on a show like this almost seems improper. Shayna Baszler and Kairi Sane also wrestled in the inaugural Mae Young Classic. So they can tell that story, and connect it to this year’s tournament. I assume it will be over by the time we get here. But if it isn’t, having the finals on this show would be tremendous. Shut up. It’s pro wrestling, not the Olympics. Part of Ellsworth’s character is that he wrestles women. And he loses. Every single time. So obviously he loses here too. They went to the trouble of bringing him back. So let’s use him! Have him go out there and throw out an open challenge to any woman in all of WWE. There are a couple directions they can go in here. One is to bring an alumni out. Beth Phoenix would be a great choice for this spot. She’d hit a clothesline, a press slam, a Glam Slam, and then be done. On the other hand, they could put Lana in there. She’s billed at 5’7, while Ellsworth is about 5’8. Weight wise, they can’t be too far from each other. So you can have that moment of tension, in which it actually looks like Ellsworth can beat Lana up. Then you maybe have her do a high-kick and knock him out. Either way, same kind of match. This entry was posted in Wrestling and tagged Alexa Bliss, Asuka, Bayley, Becky Lynch, Beth Phoenix, Carmella (WWE), Charlotte Flair, Ember Moon, James Ellsworth, Kairi Sane, Lana (WWE), Lita, Liv Morgan, Mae Young Classic, Mae Young Classic 2017, Mae Young Classic 2018, Mickie James, Molly Holly, Naomi (WWE), Natalya (WWE), Nia Jax, NXT, pro wrestling, professional wrestling, Rob Siebert, Ronda Rousey, Ronda Rousey WWE, Ruby Riott, Sarah Logan, Sasha Banks, Sasha Banks vs. Bayley, Shayna Baszler, The Riott Squad, Trish Stratus, Victoria (WWE), WWE on 07/16/2018 by primaryignition.